2. But the demand there is for data. So let me try giving that first. 10. All data collated from various government reports from 2005-11. I don't have updated data since I am not in Healthcare business anymore. 11. In 2010, I was involved with a government project to digitize and automate as far as possible the entire public health system of TN. 12. I visited almost all PHCs and 42 Secondary Care facilities. I just came out stunned at how dedicated government staff were. 13. The 42 secondary care hospitals now have a Hospital Management System implemented. It was then the first in the country. Don't know now. 14. If you visit any secondary care government hospital: you are given a patient ID and your medical record is stored for ease of diagnosis. 15. The doctor by looking at your history can quickly diagnose. The prescription is done digitally which the dispensary gets automated for. 16. This option has benefits for patients. But the system uses this information for inventory management of medical supplies. 17. Yes if you are middle class person obsessed with corruption: this system ensures there can be no leakage of medical supplies. 18. The other TN government agency that uses complete digitization of inventory to forecast demand: TASMAC. It does a brilliant job of it. 19. The staff allocation, medical supplies allocation, estimation of disease burden: all of these use quite good forecasting models. 20. The focus of various districts is targeted. 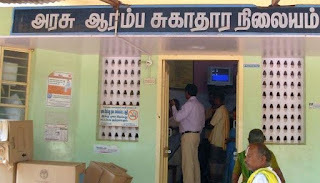 For instance Kanyakumari focuses on Dengue/Malaria. Salem on IMR. And that's data driven. 21. The tertiary care facilities are distinct since they are often attached to a Medical College. That was a challenge. 22. They often had their own information system in silos. That was at least 5 years ago not integrated. 23. But since they were referral hospitals and were training medical students, they almost always ran at full capacity. Or over capacity. 24. For whatever reason doctors - from medical officers in PHCs to Deans of colleges - seemed to take enormous pride in what they did. Do not walk into an ER of a large hospital. Especially night time. Watching unknown people being distraught over a dead 18 yo is disturbing. Stroke or No Stroke ?